Tannoy Reveal 5AThe 5A model is the latest newcomer to the revamped Reveal line from Tannoy. The 5A is an active studio monitor pair, a stripped down version of the Reveal 8D. This is the smallest active studio monitor from Tannoy to date and has much to offer if you don't like to spend a fortune on your studio monitors. There is no need for extra money spend on an amplifier as these monitors are active, therefore amplified. This will also save some much needed space in the studio. No extra cables means cleaner signals so you will be getting optimum sound with minimum effort. 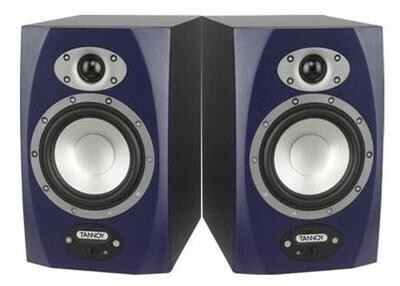 The Tannoy Reveal 5A monitors feature a frequency response of 65Hz to 30kHz which is good enough for any home studio. Distortion levels are kept to a minimum and there are XLR balanced cables for maximum quality. With an amplifier output power of Low-Frequency to 40W and High Frequency to 20W there is enough sound to satisfy the hard of hearing so if you are on a budget you should consider these active speakers. Drive units flush with the baffle surface. Bass unit development using Klippellâ„¢ analysis equipment to minimise offsets and linearise the suspension components. Tweeter with wide band design and extended amplitude response that reaches beyond 20kHz audibility to 30kHz correcting the phase response from 8kHz to 14kHz. This preserves the sound's harmonic structure and the stereo image stability. On/Mute via the Tannoy logo push switch (energy saving mode). LED indicator with Active/Energy Saving. Front mounted volume control for Home Studio and PC/MAC use. Internal construction braces the sides and rear of the cabinet against the rear of the bass driver to provide a rigid reactive mass for the moving cone assembly. Tighter bass response and clear midrange frequencies. Front baffle and rear panel tongued and grooved into the cabinet. Double insulated to prevent ground loops. CSA/CE/CCC/CB full safety approvals including China. Spare fuse in IEC mains connector. XLR and jack connector for balanced input.